A treasure from 2005: how to morph That Reading Thing into That Spelling Thing for a dyslexic adult. 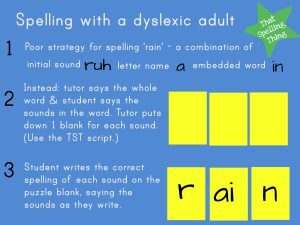 I was working with a severely dyslexic 27-year-old whose huge sight vocabulary put him beyond TRT lessons for reading but not for spelling. He struggled with the idea of words as collections of sounds because he had spent years developing his own strategies for reading and spelling – often applying them on a word by word basis. Mostly he tried to picture the word and draw it from memory, but he also used a combination of strategies that had been offered to him by previous tutors such as listening for the initial sound, spelling by strings of letter names and looking for words within words. However, he’d never heard the the concept of letters representing sounds from left to right through the whole word. Here are a few things that came up during our time together. 1. Because he was beyond the need for TRT word reading exercises, we turned the Advanced Levels into spelling lessons. Rather than having him read each word and sort it by the spelling of the target sound, I said the word then he had to tell me the sounds without writing – just listening to the word then saying each sound. As he said the sound, I put a blank puzzle piece, (a laminated square), on the table. He then had to spell the word by filling in each square with the correct spelling of that sound. 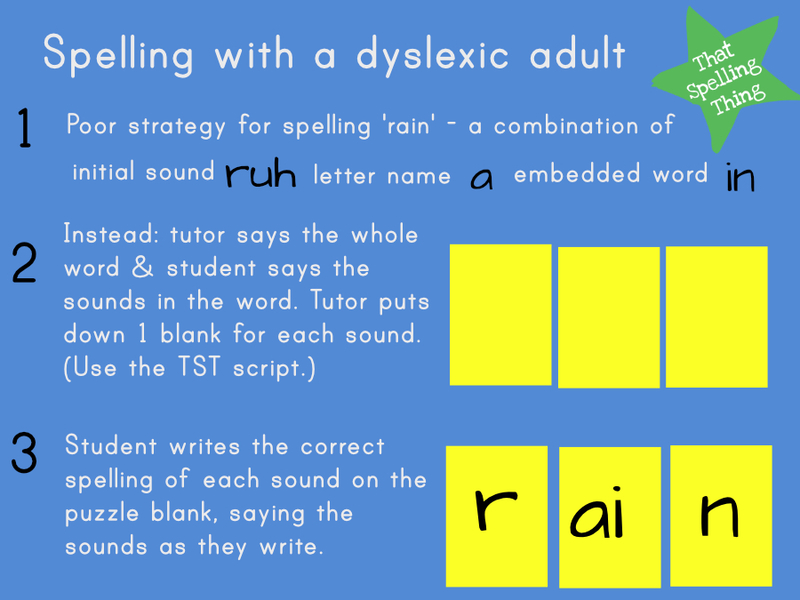 This prevented him from using his convoluted strategy of identifying the initial sound, naming letters and seeing words within words – his prefered strategy for spelling ‘rain’. Even though he spelt it correctly, the memory required to apply several strategies to a single word was debilitating. No wonder he was a reluctant writer! Using his “try a little of everying” spelling strategy, he remembered ‘rain’ as ruh (sound) a (letter name) in (embedded word). However, seeing the 3 squares on the table, he knew <in> couldn’t spell /n/ so had to rethink the idea of ways to write the “ay” sound in rain. 2. Initially he couldn’t hear (or spell) the separate sounds in blends like the spr in ‘sprain’, but after about 10 minutes of hard concentration and putting each sound on a separate puzzle piece, that became quite easy for him. He then asked to keep doing this exercise because it prevented him from using his predominantly visual strategies which constantly let him down. Having the word physically split into sounds caused him to start at the left and work through the word rather than jumping all over the place filling in missing letters based on what he imagined it should look like. 3. Finally, we talked a bit more about his education. The reason he can read is that a switched-on head teacher thought to ask the “naughty” child who was daily sent to him for behaviour issues why he was so unhappy at school. The answer was that he was so many levels behind in his reading scheme that he just didn’t want to be there. He ended up going to the head teacher every day to read aloud for an hour until he caught up with the others. He didn’t recall any lesson or error corrections and he was pretty sure the head just got on with his job while the child sat and read through endless readers. Despite the lack of organised intervention, his reading age came up several years in that time. The hands-off “learn to read by reading” method certainly won’t work for everyone, but it explains his large sight vocabulary in adulthood. It also explains his inability to read unfamiliar words and his poor spelling. Working on spelling with dyslexic adults is the biggest challenge I’ve faced. They want it to be effortless and are surprised to find that good spellers take time, think carefully and use dictionaries. That’s disappointing to hear after years of thinking everyone else is writing with such ease. Reading comes on much faster than spelling in the same time frame and students need to be warned that will happen. My conclusion after all these years is that every dyslexic adult needs time and space to get as far as they can with spelling, but they also need to learn how to access, without shame, the best technology available when writing for work or educational purposes. Technology isn’t the easy answer and it shouldn’t replace good instruction and practice, but it should be used when it can help close the gap between what a person is thinking and their ability to express those thoughts in writing.